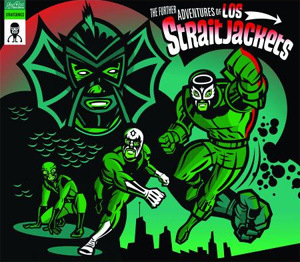 It's been six years since these four luchador-rock legends cranked out an album filled entirely with original tunes, and while the 30-minute running time of this 14-song instrumental effort is unforgivably short, nearly every composition is brimming with get-up-and-go guitars and dynamic surf beats. The first two tracks, "Cal-Speed" and "Challenger 64," kick off the collection with gusto, setting a vintage sand-and-sun mood, with subsequent selections supplying an at times harder (yet still classic) edge. Other notable numbers include "Nocturnal Twist," which offers a whimsical nod to Earl Hagen's "Harlem Nocturne" (AKA the theme to Mickey Spillane's Mike Hammer TV show), and the surprisingly languid "Mercury." That final composition notwithstanding, the recording as a whole is a brief yet boisterous bout that nicely showcases both the band's musical sense of adventure and their signature "Sturm und Twang" style.